Littelfuse inrush current limiters (power thermistors) are specially formulated and processed NTC thermistors suitable for suppressing high inrush currents in switching power supplies and other applications where the high initial starting currents are undesirable. Their unique design enables them to handle extremely high current and voltage levels. In a typical power supply application, the inrush current limiting power thermistor is used in series with the filter capacitors. Upon application of the initial voltage, the device, due to its relatively high resistance, limits the current flow to an acceptable level until the capacitors are charged. Thereafter, the device decreases in resistance substantially to a level where the voltage drop across it is negligible. For inrush current limiters, the maximum continuous steady state current, either DC or RMS AC, which the device is capable of passing. The maximum steady state current for a Littelfuse inrush current limiter is determined assuming a maximum operating ambient temperature of 65°C. 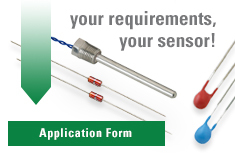 If a specific application requires ambient temperature operation above 65°C, custom designed devices are available. For inrush current limiters, the approximate resistance of the device under maximum steady state current conditions.